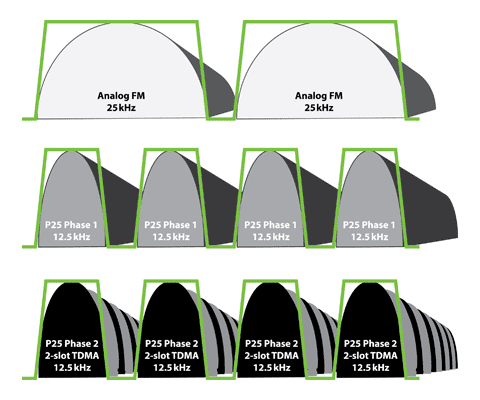 (P25) Phase 2 refers to P25 requirements and standards for a digital Common Air Interface (CAI), Time Division Multiple Access (TDMA) based, which provides one voice channel per 6.25 kHz channel spectrum efficiency. 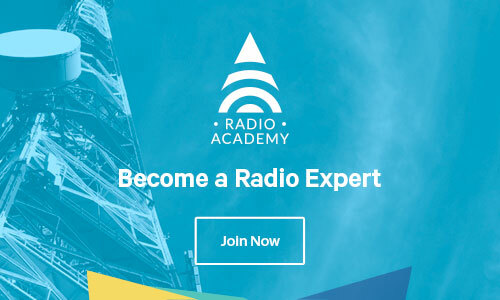 The current standards effort focuses on 2-slot TDMA which provides two voice traffic channels in a 12.5 kHz allocation. At this time, Phase 2 is all about traffic channels on trunking systems. There is currently no schedule for conventional Phase 2, and a trunking control channel (1 time-slot control channel data and 1 time-slot voice) is also a future task. The P25 standards for Phase 2 trunked operation were published in 2010 and the standards for Phase 2 conventional operation are yet to be defined. Source: National Institute of Justice web page, “Understanding FCC Narrowbanding Requirements”, retrieved September 12, 2011. ‘real estate’ into frequency divisions. TDMA divides the spectrum ‘real estate’ by time divisions. P25 Phase 1 uses FDMA. P25 Phase 2 uses TDMA. Outbound: H-DQPSK (Harmonized Differential Quadrature Phase Shift Keying) used in the base station fixed-site equipment and requires linear transmit amplifiers. A result of this is that it requires a more complex receiver in the base station, where the complexity is concentrated, rather than the SUs. Talk-around remains 12.5 kHz Phase 1 FDMA. 'Phase 2' is not a single document or standard, but a suite of standards. Documents that allow vendors to test their designs (conformance, interoperability, and recommended compliance assessment tests) have been published. Modifications to several supporting documents (such as the trunking messages) have been published. A range of other standards documents have been impacted by Phase 2 (Vocoder, Encryption); ISSI remains to be completed. The first drop of Phase 2 standardization, trunked 2-TDMA is reaching completion. The protocol definition documents have been published, as have the performance test documents. Four test related document remain, they are expected to publish this in 2011 or early 2012. The ISSI changes for phase 2 are also outstanding. They should be published in the first half of 2012. Vocoders convert audio streams into compressed digital streams ready for transmission. Phase 1 operation uses "full rate" vocoders while Phase 2 operation uses "half rate" vocoders. There are multiple generations of these two vocoder classifications. National Institute of Standards and Technology (NIST) has found that enhanced vocoders (both full and half rate) are significantly better than the base line vocoder, with no significant statistical difference between the quality of the full and half rate vocoders. Phase 2 radios have a dual rate vocoder installed and they use the correct transmission mode automatically, as standardized in the TIA2-102 suite. In addition to the vocoder, the received audio quality depends upon many elements including, for example: the radio mechanical package, the speaker diameter and power rating, the frequency response of all of the audio circuits, signal error correction and network coverage, the electrical and acoustic properties of a radio, the correct set up of audio accessories (correct level/gain settings etc. ), coverage interaction. As at September 2012, the scope of the P25 CAP is for testing Phase 1 equipment only. Supplier's Declaration of Compliance (SDoCs) or Summary Test Reports (STRs) for Phase 2 equipment relates only to their Phase 1 modes. 700 MHz 12.5 kHz Phase 1 January 1, 2015 Voice networks operating before this date can continue to operate in 12.5kHz channels until December 31, 2016. All new networks must operate in 6.25kHz channels or demonstrate equivalent spectrum efficiency. 6.25 kHz Phase 2 January 1, 2017 These networks must operate in 6.25kHz channels or demonstrate equivalent spectrum efficiency. http://www.fcc.gov/encyclopedia/vhfuhf-narrowbanding-information FCC encyclopedia of VHF/UHF narrowbanding information. http://en.wikipedia.org/wiki/Project_25 Project 25 on Wikipedia for more information on the suite of standards for digital radio communications in North America.